Simply attending the right conferences can be a game-changer for those in the medical device industry. You might strike up a new partnership, make valuable new connections and of course, bring important new knowledge of regulatory and other industry trends back to your company.There are some medical device conferences that we always attend, and others that we include based on the positive feedback of others. Here is our list of top conferences for 2019 - which will you attend? 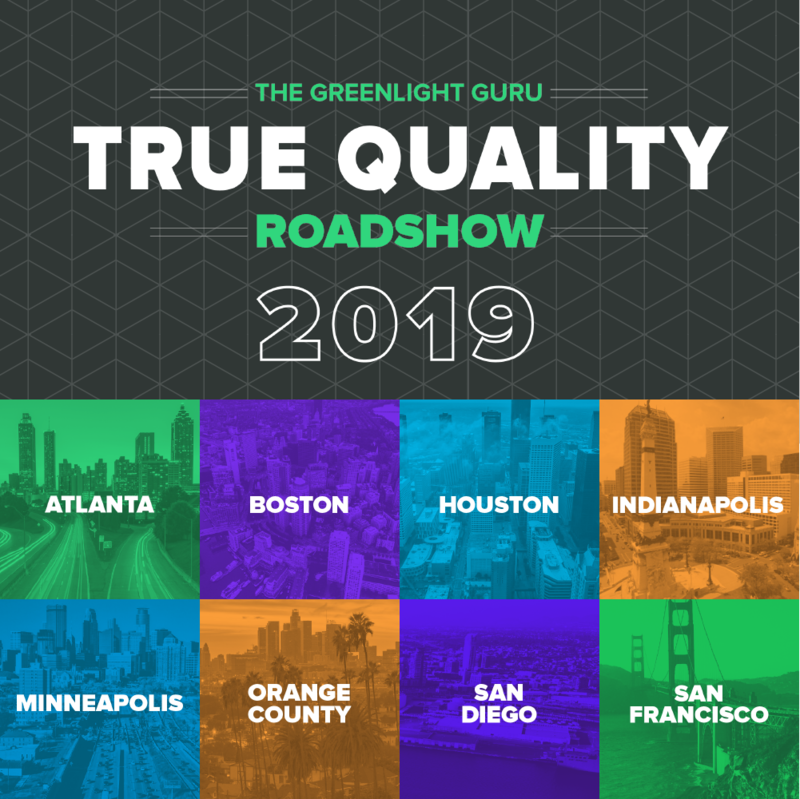 In an effort to make 2019 the year of True Quality in the medical device industry, we are excited to share with you a series of upcoming events packaged into one unforgettable name, The Greenlight Guru True Quality Roadshow 2019. Coming off the heels of a successful partnership with FDA to cross-promote the benefits of their Case for Quality initiative, the decision to build and embark on an educational roadshow is intentional, serving as a sign that our thought leadership efforts are separate, but equal to the efforts we put forward building our industry leading software platform. This determined focus on education, redefining best practices, and keeping you ahead of the ever changing regulations is what has catalyzed the excitement behind Greenlight Guru and The True Quality Roadshow. Free Bonus Giveaway: Click here to download a printable schedule of 2019 conferences to save and reference for yourself later (or share with a colleague). J.P. Morgan’s annual healthcare conference is a banner event in the industry. Heading into its 37th year, the conference is the largest and most informative healthcare investment symposium in the industry. They expect more than 10,000 attendees in 2019, and over 450 private and public companies represented. At the time of writing this, keynotes have not been announced, but they’re usually very high-quality. Past speakers include Bill Gates, Joe Biden and Ann Wojcicki. You can also expect to find thousands of investors from around the world, and companies ranging from startups to those with more than $300 billion in market cap. The Digital Medicine and MedTech Showcase is a dedicated home for the MedTech community during the BioTech Showcase conference. Registration for the event will also include complimentary access to all three days of the BioTech Showcase. Highlights include industry-leading perspectives of digital medicine and MedTech programming, the ability to request and schedule one-on-one meetings with potential investors (or companies you’d like to invest in), and curated presentations. Heading into its 34th year, highlights of the conference include spotlights on 3D printing and smart manufacturing. It’s also an opportunity to expand your professional network, explore career opportunities, and find lasting partners to help you get further, faster. HIMSS is an annual conference that brings together 40,000+ health IT professionals, clinicians, executives and vendors from around the world. You will have the opportunity to learn, meet and network over a range of health information and technology topics. The 2019 conference features sessions such as cybersecurity, health information exchange and connected health. The Council for Entrepreneurial Development is hosting the 28th annual Life Science Conference on February 26-27, 2019 in Raleigh, NC. As the premier life science event in the Southeast, the conference attracts 800+ attendees including entrepreneurs, investors, corporate leaders, and industry visionaries from across the nation. Speakers are yet to be announced at the time of writing this, but you can expect to hear from some of the biggest names in life science. They also offer opportunities for entrepreneurial companies with high-value resources to accelerate business growth. Greenlight Guru is traveling coast-to-coast for our first ever roadshow conference series. Connect with other medical device professionals in your local community in a setting dedicated to all things Medical Device. Share an intimate experience with industry thought-leaders, such as Greenlight Guru founder and VP QA/RA Jon Speer, during the Fireside Chat session. Gain exclusive access into the current state of the medical device industry, regulatory trends and updates, and best practices in attaining True Quality. We look forward to seeing you! This conference is a partnership between The Biomedical Engineering Society (BMES) and the US Food and Drug Administration (FDA). It will provide a forum for participants involved in the development and evaluation of medical devices to meet and share their expertise, establish collaborations, and discuss strategies to effectively utilize computational modeling to support patient care and improve final outcomes. Technical tracks will focus on topics related to the increased role of simulation as evidence for healthcare and will be chaired by a panel of researchers and modelers from industry, government, and academia. See first-hand how artificial intelligence is impacting clinical care. This is a global gathering of more than 1,000 senior health care leaders hosted by Partners HealthCare in the heart of Boston. It was established to respond to the intensifying transformation of health care and its impact on innovation. The Forum is rooted in the belief that no matter the magnitude of that change, the center of health care needs to be a shared, fundamental commitment to collaborative innovation – industry and academia working together and its ability to improve patient lives. It comes highly rated by past participants. This conference is recognized as an exceptional event for MedTech investment and networking. Ireland’s medical technology sector has evolved into one of the leading European clusters for medical technology and diagnostic opportunities. Dublin, the conference location is at the heart of this technology sector. The conference brings together more than 450 leading experts, innovators, and key decision-makers to discuss the critical challenges facing the ever-evolving global MedTech community. The Design of Medical Devices Conference provides a national forum to bring together top medical device innovators. In its sixteenth year, this MedTech conference includes industry experts as keynote and featured speakers, plus four days of workshops, symposiums, scientific poster sessions and technical/scientific sessions. MedCity INVEST is the premier national healthcare investing conference based in the Midwest, uniting active investors with corporate business development executives to facilitate investment opportunities with the most promising healthcare startups. More than 300 venture capitalists, angel investors, prominent industry executives, innovative thought leaders and more will attend. This conference is a collaboration between the FDA and Xavier Health, bringing the global medical device community together to openly discuss the most pressing issues facing our industry. You have the opportunity to influence decisions and have your voice heard as you interact with leading FDA officials and field investigators, along with global industry experts. Topics this year include things like supply chain performance and data integrity. 10x Medical Device Conference is the cross-functional event where the entire medical device ecosystem convenes to grow your skills, network, and profit. It’s designed to foster strong professional relationships among medical device players eager to learn smarter ways to do things with industry-leading resources. This medical device event is geared equally for senior and junior level professionals in the medical device industry. BIOMEDevice Boston connects you with more than 4,500 engineers and executives — and more than 450 leading suppliers — across New England's thriving MedTech industry. In partnership with the Massachusetts Medical Device Industry Council (MassMEDIC), BIOMEDevice Boston is a powerful end-to-end industry showcase covering today's emerging biomedical trends and innovations. Explore the full spectrum of cutting-edge solutions you need to make faster, cheaper, and smarter medical products at the most comprehensive industry event in the region. This is a new conference, combining European powerhouse conferences, Medtec Europe and MT-CONNECT. It is billed as THE medical technology event in Europe, targeting the entire medical technology supply chain, from prototyping to full-scale manufacturing and processes. The program is packed with summits and exhibitions and should have something for virtually anyone in the industry. In its 18th year, the MedTech Conference, formerly known as the MedTech Investing Conference, will bring together investors, executives, and entrepreneurs from across the US and around the world. The tightly packed, daylong event centers on the primary forces that make MedTech work. Panels will cover critical issues facing startups including valuations, financing, business models, reimbursement, and exit opportunities. DeviceTalks is an industry-leading event series for medical technology professionals, designed to amplify the stories behind life-saving technologies and provide exclusive insight into the world of medical devices. AAMI is the premier conference for healthcare technology management. It is attended by more than 2,300 biomedical equipment technicians, clinical engineers, and others who manage or support medical devices for healthcare institutions. Educational sessions focus on practical solutions for the challenges that attendees face in their work every day. The Expo provides an opportunity to see the latest technologies from many of the world's leading medical-equipment manufacturers and service providers. Medical Design & Manufacturing (MD&M) East is the largest and longest-running MedTech event on the East Coast. Medical device engineers, R&D managers, and executives from across the Northeast and beyond rely on this event to stay on top of the latest industry advancements, including first looks at innovations yet to hit the market. At MD&M East, you'll source from the region's largest collection of cutting-edge suppliers, deepen your expertise with free, conference-level education, and network with thousands of professionals who can help you advance your projects – and your career. The 27th annual conference will focus on understanding the challenges facing the MedTech startup today, and the strategies that are emerging to respond to these challenges. In a series of topical panels presented over the course of one day, you will hear from industry CEOs, venture capitalists, industry strategists, investment bankers and market analysts. This year the format involves a dinner and interview on the 20th in Menlo Park, then a one-day conference in San Francisco on the 21st. For the very first time, AcKnowledge Regulatory Strategies, LLC is bringing together a highly accomplished group of former FDA employees to present and discuss regulatory topics and updates to U.S. medical device regulations. It is intended for regulatory and quality assurance professionals, medical device manufacturers and suppliers, small startups, and investors with critical insight into the FDA's regulatory process. Topics to be covered include regulatory strategy, pre-submissions, and the premarket submission process for 510(k)s, de novos, IDEs/HDEs, and PMAs. The conference will also feature sessions dedicated patient experience, combination products and CBER devices, as well as digital health and cyber security. Xavier Health’s AI Summit always provides great insights into industry use of AI and where the future is headed. At the time of writing this, the 2019 schedule is to be confirmed, so save the date! This is the leading MedTech Conference in North America, bringing more than 3000 attendees from 35+ countries. It features over 300 speakers, more than 100 sessions and presentations and over 1600 MedTech Connect meetings. 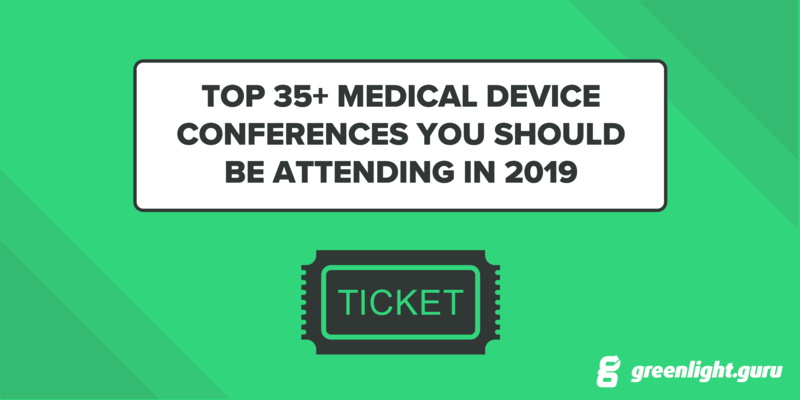 With world-class educational opportunities and networking, diverse attendees and some top policy-makers, this is a premier event for anyone in the medical device industry. Join the only conference focused exclusively on regulatory for the healthcare products industry. Find new ways to examine and solve regulatory challenges, network with the best regulatory professionals in the world, and get the latest, most up-to-date industry knowledge. Network with the brightest minds in regulatory and hear from representatives from health authorities such as the FDA, EMA, Health Canada and more. The 15th Medtec China is a premier manufacturing and sourcing event for medical device manufacturers in China. Leading suppliers from many countries throughout the world attend and the target visitor profile comprises senior management, R&D engineers, production engineers and QA professionals who are searching for components, materials, technologies and solutions for their production lines. Billed as the Midwest’s largest MedTech event, Medical Design & Manufacturing (MD&M) Minneapolis is where serious professionals find the technologies, education, and connections needed to thrive in the MedTech community. There are over 5000 attendees and 60+ speakers. The 2019 event has a special spotlight on all-things cardiovascular. Join the discussion with over 250 of your industry peers, exploring challenges and opportunities in medical device development, quality management, speed to commercialization, and regulatory harmonization. Hear first-hand case studies and walk away with strategic insights to streamline processes, optimize development, design, decrease risk, improve speed to market, reduce costs, and remain compliant in a rapidly evolving landscape. Furthermore, each year, leading individuals from the fields of business, research, and politics grace this top-class event with their presence — naturally alongside tens of thousands of national and international experts and decision-makers from the sector, such as yourself. An extensive exhibition and an ambitious program — which together present the entire spectrum of innovations for outpatient and clinical care — await you in Düsseldorf. Silicon Valley's Premier Event for MedTech Professionals. Whether it's mHealth or the Internet of Things (IoT), BIOMEDevice San Jose showcases emerging trends and innovations that will set the tone for the BioMed industry in 2019 and beyond. The conference offers training on digital device trends and exploring effective ways to overcome barriers to market entry, all in a two-day Connected Health Device Development Summit. With thousands of attendees, more than 300 leading exhibitors, and numerous thought leaders set to meet face-to-face, BIOMEDevice San Jose is a must-attend opportunity for MedTech professionals to accelerate industry knowledge and network.